STRICTLY LIMITED HEAVYWEIGHT REMIX DISC stamped on plain white innersleeve. Kahn & Neek aka Gorgon Sound and Geneva’s top-shot nutters O.B.F. Soundsystem are back on Peng Sound Records, on remix duties, taking Dubkasm’s Concrete & Steel (PengSound010) on a version excursion through to the outer reaches of overdosed dub. Gorgon take the original cut into half-step dubwise territory, with one of their most deadly crossover cuts to date, expertly tuned reverbs and signature melodies build amongst a continual pressure of bass & drum. Cut to the highest standard by Lewis at Stardelta, this one is a real treat for the ears and it sounds absolutely deadly on vinyl. On the flip of the disc, O.B.F. crank it riiiiight up to the reds, and deliver some of the most ruff & tuff, industrial-strength steppers that we’ve heard in a long time. Things are already mad on the first cut… Skip to the 2nd cut and the trash-can snares, raggo-electronics and bassline are left to their devices, stripped back to the bone and utterly militant. This is 5am material, heavyweight dub that will control the dance. Designed – as always – by Studio Tape-Echo. Pressed on 180gsm heavyweight wax. 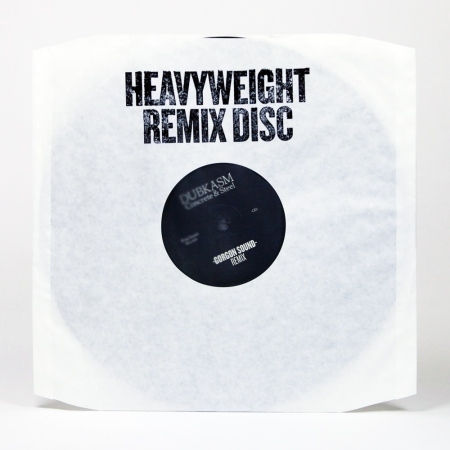 Each of the paper inner sleeves come slammed with an oversized ‘heavyweight remix disc’ stamp.